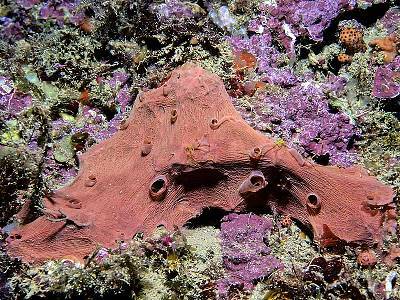 Description: This sponge looks like a thinly stretched skin extending across rock surfaces. 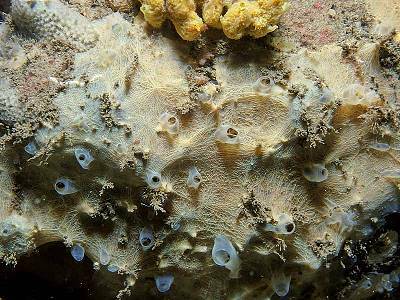 It has a few large oscules with transparent rims, which collapse on disturbance. The colour is usually pink to grey. Patches extend to 20cm or more across. It has no spicules. 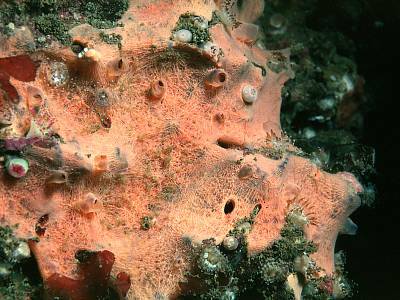 Habitat: On steep rock faces and boulders in depths of 20-30m. Distribution: A well-known species in the Mediterranean which seems to be becoming more common in Britain and Ireland. Kerry Head shoals and Aran Islands in western Ireland. Rathlin Island, north Pembrokeshire, Scilly Isles and Plymouth. Picton, B.E. & Morrow, C.C. (2016). Hexadella racovitzai Topsent, 1896. [In] Encyclopedia of Marine Life of Britain and Ireland.